The tape begins just before Black Dog. Plant pauses during the call and response with the crowd when no one responds. A barrage of shouted requests for How Many More Times comes from the crowd as Plant attempts to introduce Bron-Y-Aur Stomp. Page plays a bit of Layla before The Song Remains the Same. He's absolutely on fire during the guitar solos, playing with lightning-fast precision. There is a cut in the tape near the end of The Rain Song. Page solos wildly as Bonzo thrashes angrily at anything within reach and Plant repeatedly shouts "got a cold sweat!" during the lead-in to the bow solo in Dazed and Confused. Plant unleashes a few Tarzan-like wails at the end of the bow solo. Page absolutely shreds through the first guitar solo. Bonzo is like an unstoppable blitzkrieg, hammering away with unbelievable force. The instrumental machinery is in full swing during the amazing workout section. Each line of the final verse is punctuated by a machine gun snare blast from Bonzo. The outro features an excellent stop-start rhythm as Page's fingers race up and down the fretboard. A devastatingly heavy performance. One of the best thus far. Plant introduces Stairway to Heaven as "a beautiful song." Unfortunately, the tape is cut during Page's guitar solo. The theramin freakout during Whole Lotta Love is bookended by a frenzied funky jam, the latter part of which includes someone playing bongos or congas. The explosive Everybody Needs Somebody to Love section is preceded by an erratic drum solo interlude from Bonzo. Plant sings a brief reference to D'yer Mak'er during the breakdown. The riotous medley includes Boogie Chillen', Elvis Presley favorites (You're So Square) Baby I Don't Care and Let's Have a Party, which again includes the final fanfare repeated ad nauseam before I Can't Quit You Baby, featuring yet another incredible blues improvisation, and The Lemon Song. The band closes the show with The Ocean. The tape is a combination of two sources. The audience recording, which runs through the beginning of Dazed and Confused, is distant and a bit muffled. The soundboard recording is excellent, if a bit hissy during the quiet passages, and runs through the end of Whole Lotta Love when the audience recording returns for The Ocean. The soundboard tape alone is worth the price of admission. For me this is the best European 1973 gig surely. It was my very first Led Zeppelin bootleg too. Despite the not so good audience tape (wich i find listenable however) this concert should be an must hear! 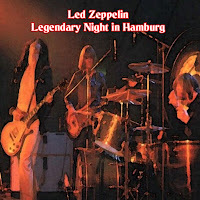 It doesn't get any better than Led Zeppelin in Europe during 1973. Plant's voice takes a back seat to the other 3. The audience tape source is clear, probably because the German crowds were reserved. There are exceptions to this when fans start yelling for "How Many More Times", "The Lemon Song", and "Led Zeppelin II". The band plays great through out. Highlights are "Dazed and Confused". and "Whole Lotta Love" The interplay bettween Bonzo, Page, and Jones has to be heard to be believed. Bonham's start/stop drumming in Dazed is crazy, I can never get tired of Dazed and Confused during this era, it was powerful amd it wasn't bogged down like it would be 2 years later. This is a mix of both soundboard and tape. Its well worth seeking out. There is also another aud tape that came out some time later that gives us Stairway To Heaven complete. I have not gotten to that yet, but I will. I can't Quit You is possibly the best version they ever performed live!